Goal: Catch up on stories from last summer before embarking on this summer’s adventures. Okay. Go. 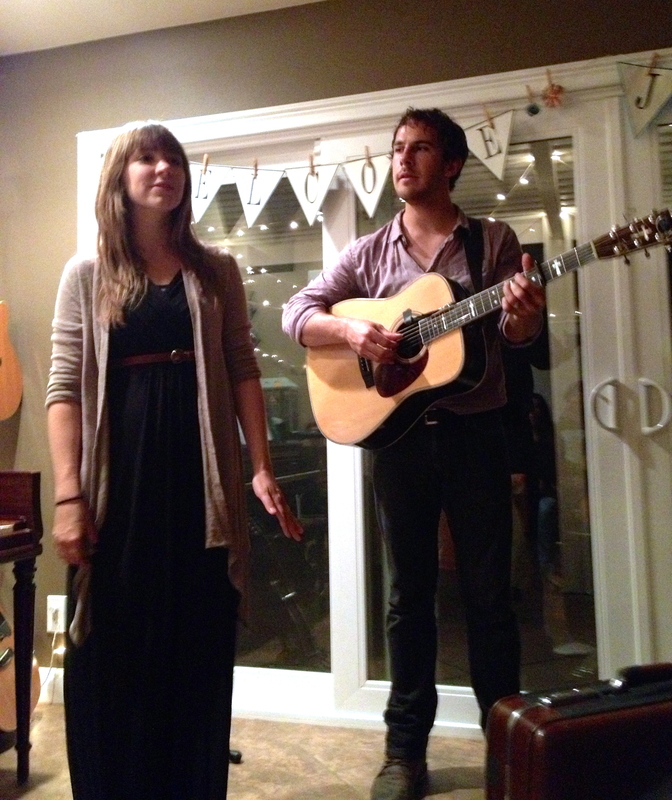 Our last visit to Minnesota was in August. We’re going again in exactly one week. I can’t wait. Last August’s trip was wonderful, but bittersweet. My Granddad passed away a year ago, and it makes me sad that I will never fish with him again, or do the Bible readings with him again, or hear his funny songs again. But, as my dad said at the funeral, Granddad believed in a hope that was reasonable: the resurrection. God created us with the ability to reason and created a world full of order and beauty for us to all marvel at. So, “why is it considered incredible among you people if God does raise the dead?” as Paul asks in Acts. We will see Granddad again soon. On this particular trip, in the day and half we spent alone together, I asked my Grandmom to sit with me for a couple hours and let me record some of her stories…about growing up on a farm in Vermont, moving to the Midwest as a young woman, becoming a chemist during a time when women simply didn’t do that, being asked on lots of dates (as being practically the only woman at her workplace put her in a good position for! 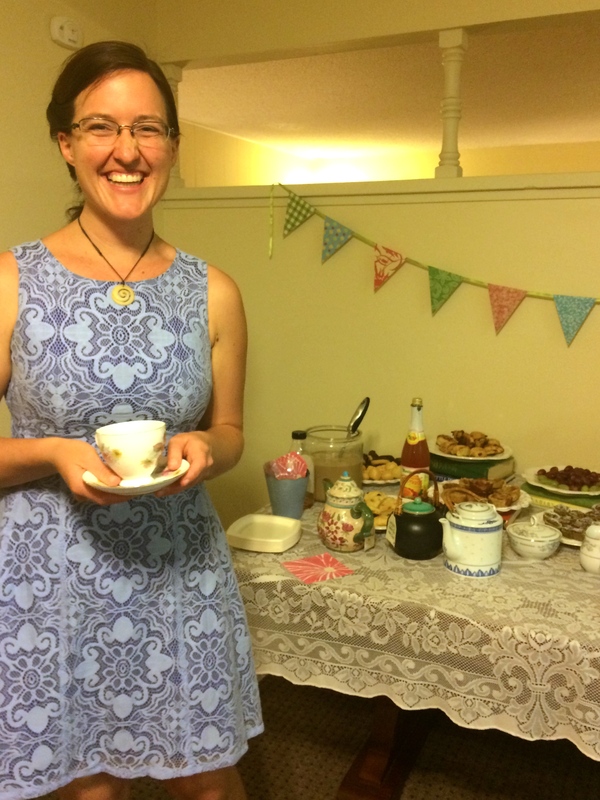 ), meeting and marrying my Granddad and learning the Bible together. If you didn’t know this about my grandmother, she still volunteers at a nature center and does pond walks for children. She also spent many years volunteering at the Minnesota Science Museum; seeing the latest exhibit there was always a highlight of my childhood visits (okay, and my adult ones–who are we kidding here?) 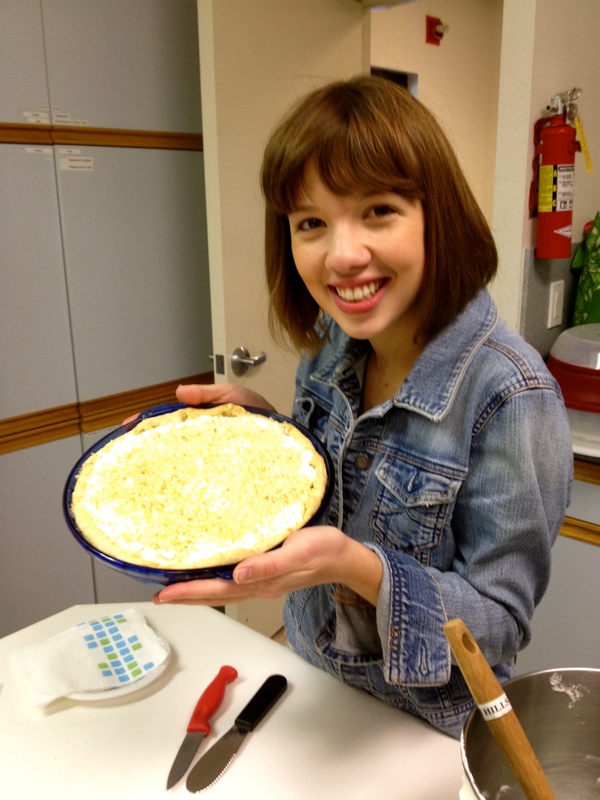 Of course, she is also a pie-maker extraordinaire. 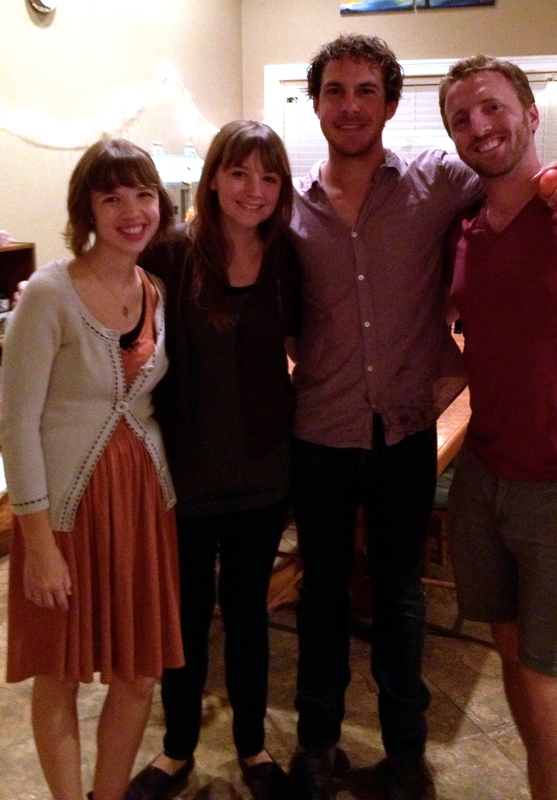 I am so thankful for the legacy that she and Granddad are leaving for our family. Once again, we visited Minnesota at the wrong time of year to pick the ever-elusive red currants and make a pie out of them. 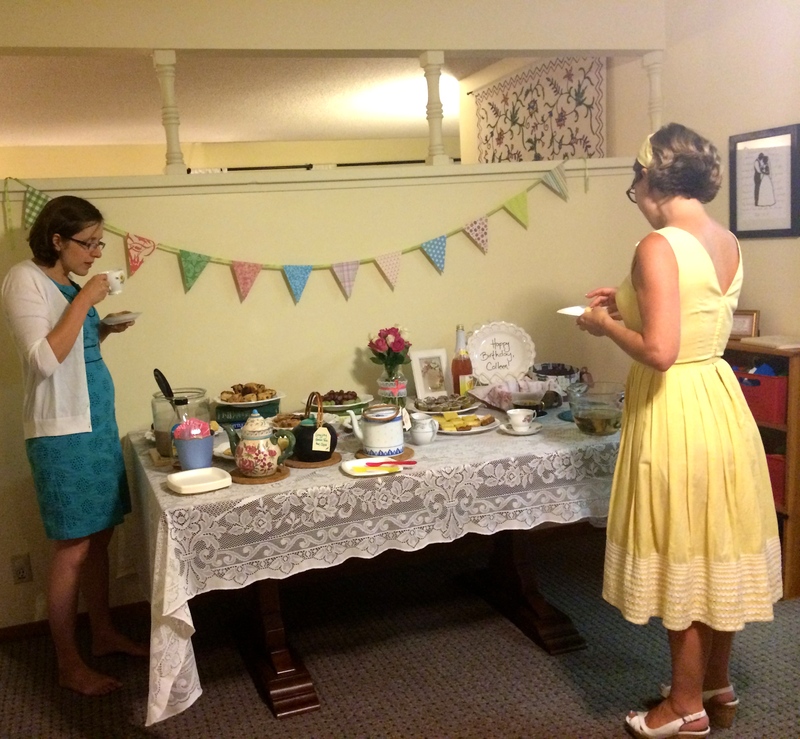 Nonetheless, there were plenty of pie opportunities. One that I had been meaning to pursue for some time was a legendary recipe I had heard stories about but had never tasted myself; Grandmother’s Chocolate Angel Pie. My cousins and aunts and uncles had long talked about this wondrous concoction and I knew that I wanted…no, needed…to learn how to make it in order to continue climbing the ladder to Pie Mastery. It was the next achievement to unlock. Grandmom didn’t have a recipe written down for this pie, per se. She uses elements of a recipe for Chocolate Dream Pie that she got from her roommate’s aunt when she was young Marie Gerdon and had just moved to Michigan from Vermont (the aunt was a high school Home Ec teacher). 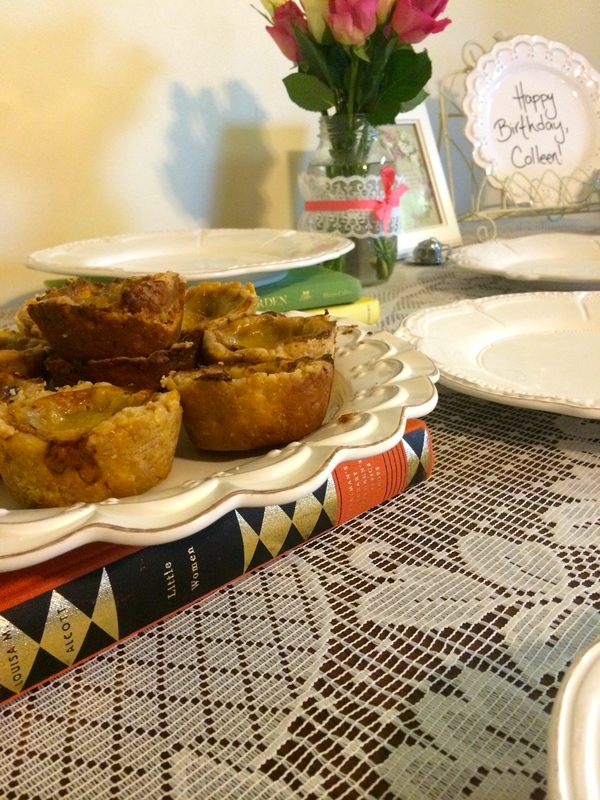 She also referred to a recipe for an unbaked Chocolate Cream Pie from the Joy of Cooking, as well as a pamphlet from the 60’s entitled “Betty Crocker’s Merry Makings: Fine Foods for Happy Entertaining”. This pie comes together quickly and is fun to make. Although it requires the use of an oven, the temperature never gets set higher to 300 degrees, so it’s a good summertime choice if you’re trying to avoid heating your house up. 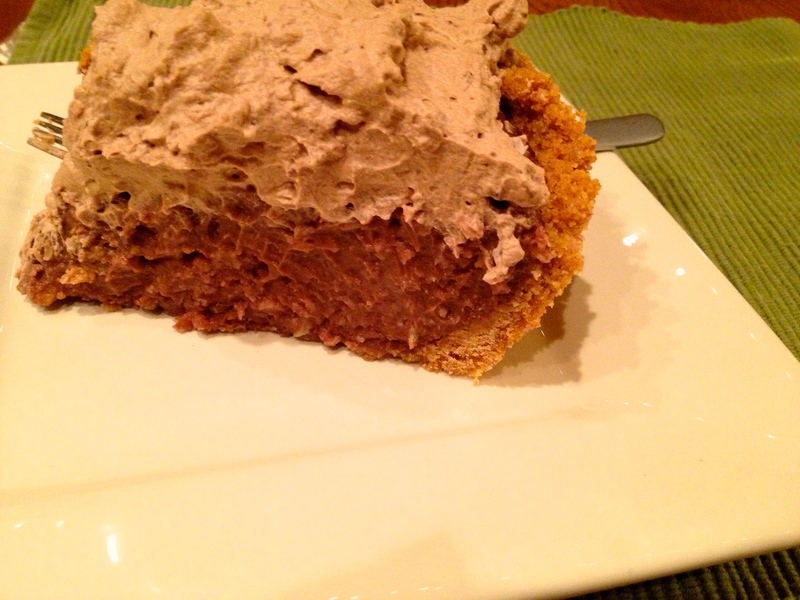 The final result is very yummy…a slightly chewy, nut-studded layer of meringue crust filled with light whipped chocolate cream…and I think you should all try it. So much so that I took detailed notes and am writing up the recipe below. After all, pie is meant to be shared. Use a spatula (we used a spoon and our fingers!) 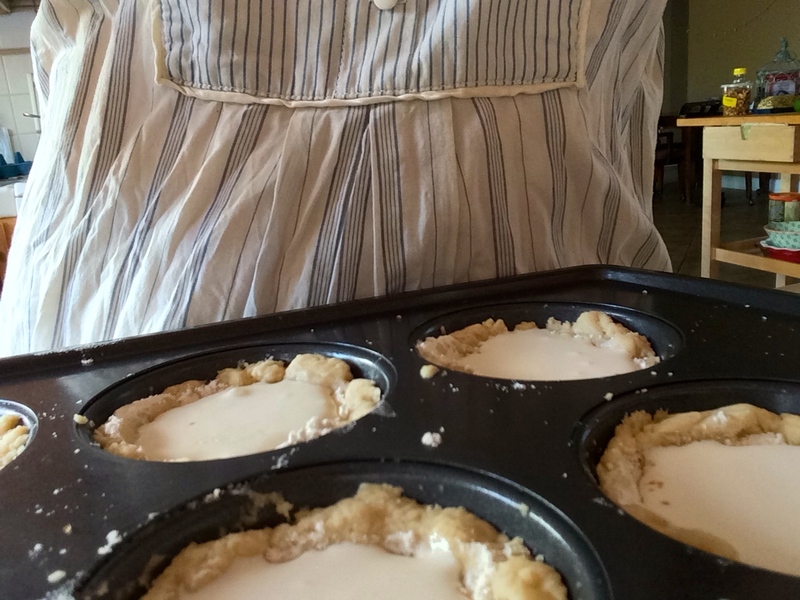 to round the meringue into a pie shell (in a pie dish). It should touch the top rim of the pie dish all the way around. Bake for 55 minutes, making sure it doesn’t get too brown (rotate the dish halfway through baking). Melt chocolate. If using a microwave, melt on high for 30 seconds, stir, microwave for 30 seconds more, stir, and continue heating and stirring in 10 second increments until the chocolate is completely melted. Whip 1 cup of whipping/heavy cream and fold in the melted chocolate. 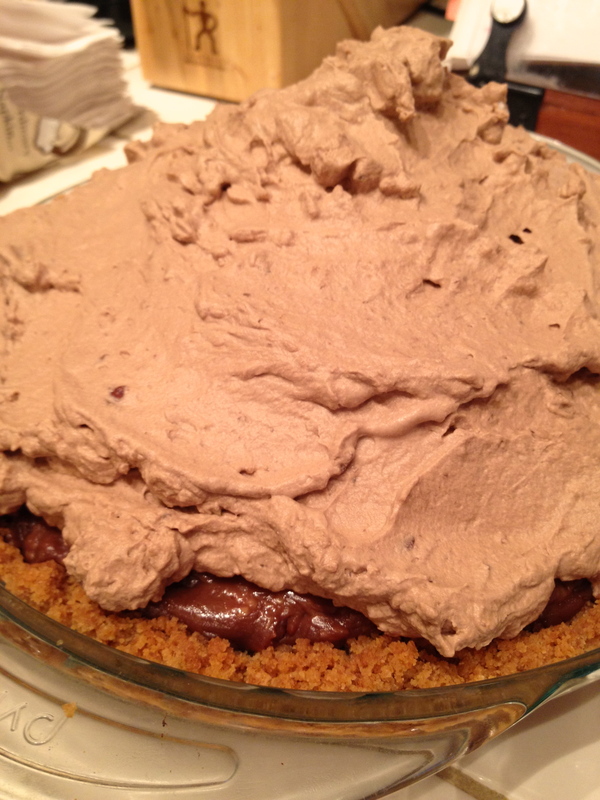 Spread chocolate cream in cooled pie shell. Refrigerate until ready to serve. 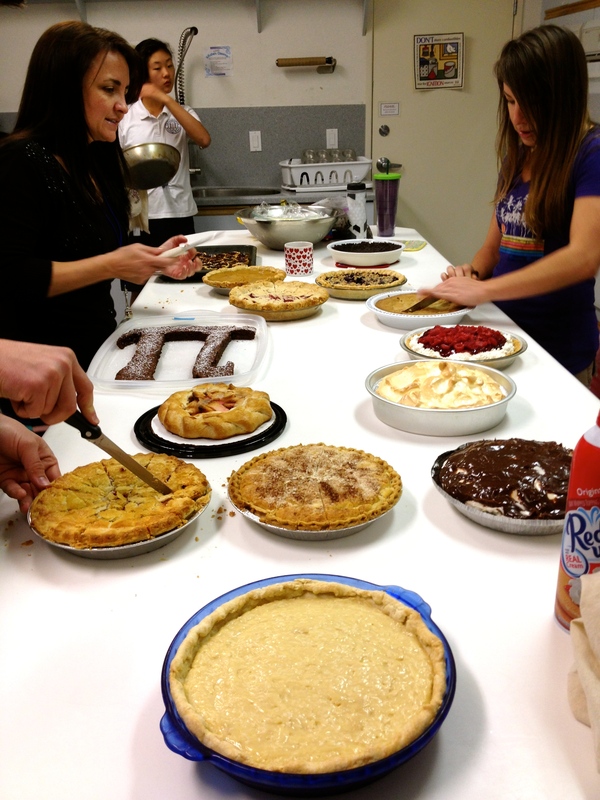 Pi Day comes but once a year, but if you’re lucky enough to teach at my school, Pi Day lasts an entire week each March. Good stuff. 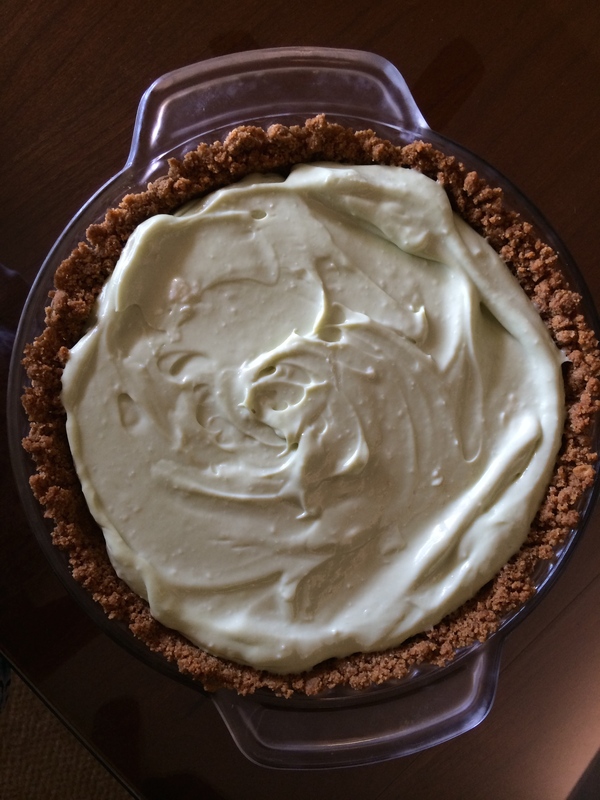 Following in the footsteps of many worthy predecessors (such as 2015’s Avocado Cream Cheese and 2014’s Coconut Cream) was a pie I had been excited to make for a long time, due to my great love of the main ingredient: Niel’s Chocolate-Macadamia Nut Cream Pie. One time, I was working late and a coworker had recently returned from Hawaii and generously brought eight tins of flavored macadamia nuts back with her. 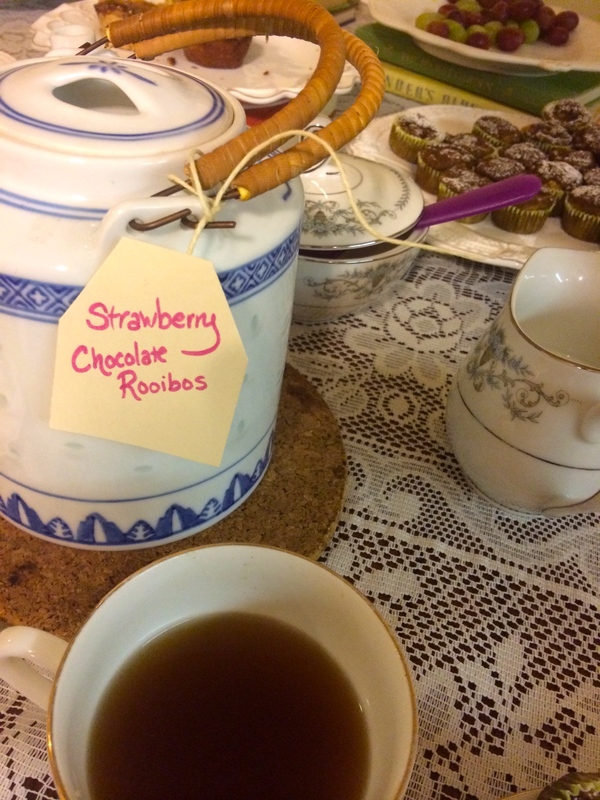 She left them in the kitchen, and I knew others had at least gotten the opportunity to try them that day. So uh after everyone else went home I took it upon myself to polish off the remainder. Oh, there are almonds in the crust. I love you too, almonds. But you’re not as much of a novelty so I didn’t stuff as many of you in my face while I was baking this pie. 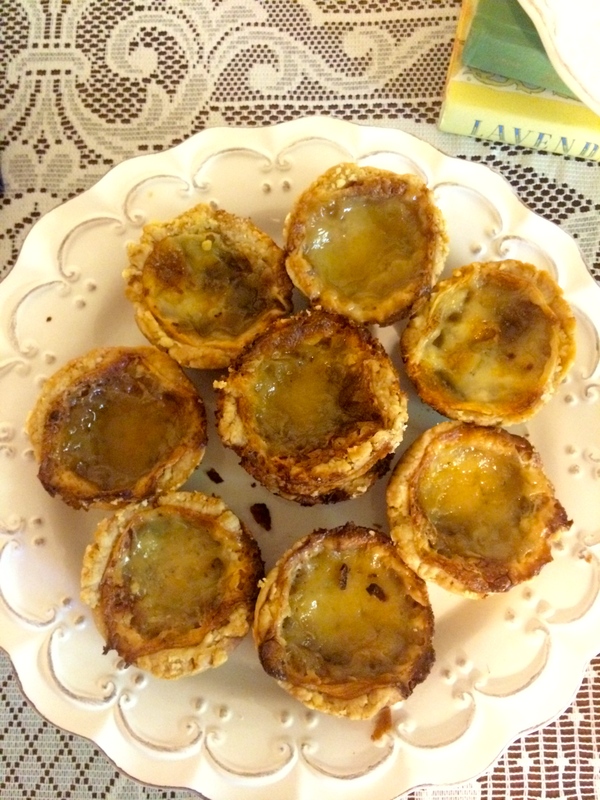 Nutty pastry crusts (recipe in Ken’s book) are very very delicious things and can be made with a variety of nuts…other pies in my past have called for walnuts, or peanuts. 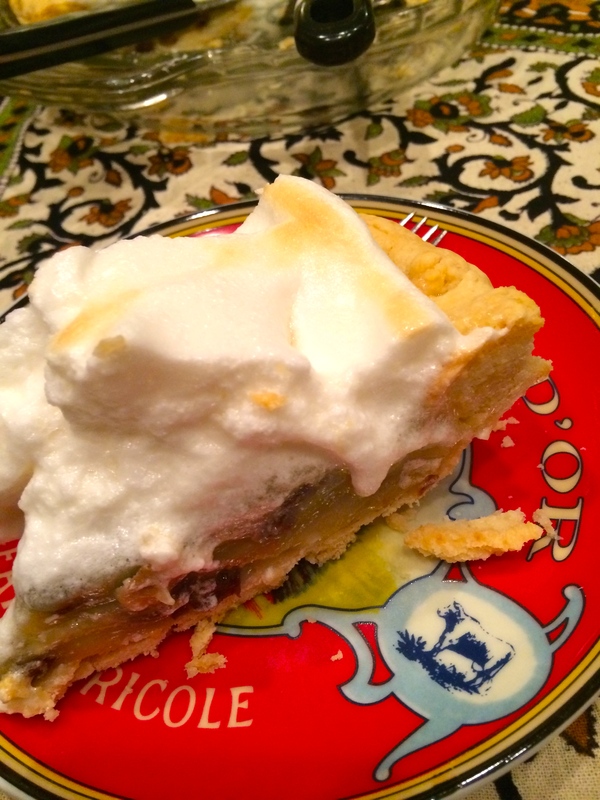 The almond crust here really adds to the level of Specialness of this pie. Only thing to really note about nutty crusts is that they do tend to be much trickier to work with. Don’t be surprised if the crust doesn’t hold together as well as a typical pastry does when you roll it out, and if small cracks form in the bottom as it pre-bakes. Case in point. Don’t worry, you’ll never notice-the filling is never runny enough to sneak down into that crack. Plus, the next step is to cover the bottom of the crust with chopped macadamia nuggets anyway. The chocolate cream pie filling goes on top of the macs. A layer of plastic wrap smoothed over the top prevents a skin from forming when it’s refrigerated. Once the pie is refrigerated for hours, it’s completed with a layer of whipped cream and topped with more marvelous macadamias. Et voilà! Like most of Ken’s pies, this one had all the flavor you could ever hope for and a subtle, not sickly, sweetness. This is helpful when you’re trying to eat multiple slices of pie at 10:45 am while also avoiding sugar crashes and stomachaches as much as humanly possible. There are always so many delicious options. 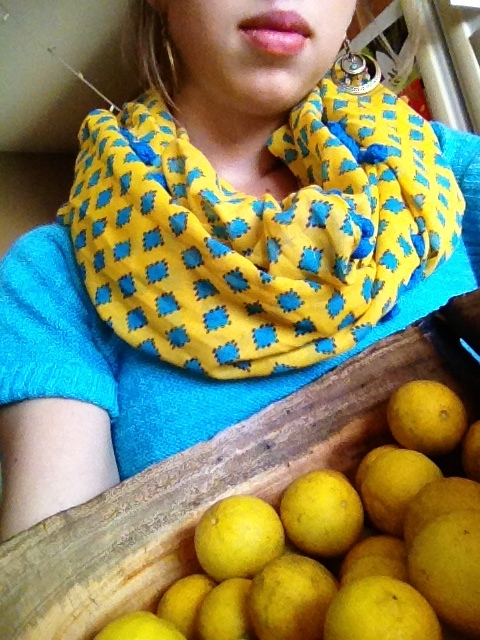 This post has been brought to you by circles, the Hawaiian islands, Trader Joe’s, and coral fingernail polish. 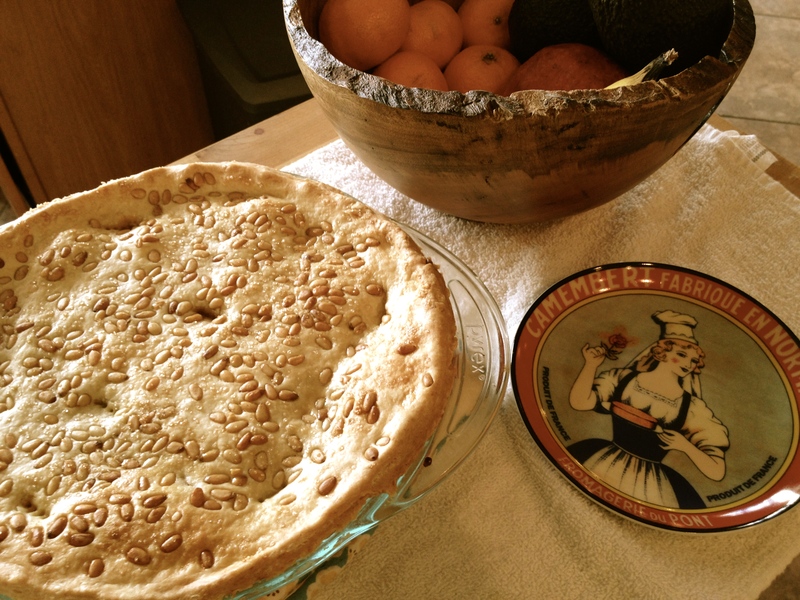 Nancy was kind enough to share some pictures of the pie success and I thought you all might like to see them too! Great job, Nancy! I hope while this was your first pie, it won’t be the last! 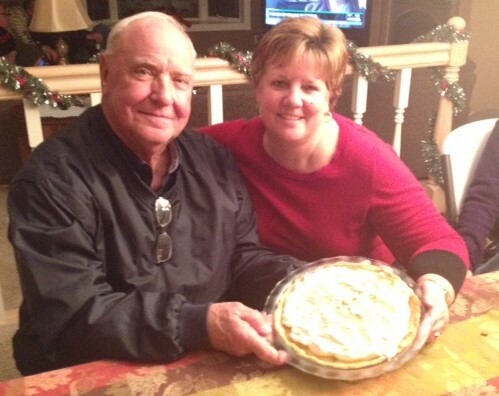 If you want to read some more Thanksgiving 2014 pie stories, check out the latest post Ken’s put up on the Pie Academy blog. My friend Tim’s pie is pictured, and I’ll be writing soon about the Maple Pecan Pie I made that’s mentioned at the very end of Ken’s post! I am delighted to announce another (small) milestone on my journey to 300 pies. 125! That means…er…only 25 more pies to the halfway point. I think this journey won’t soon be over. The good news is, although it’s slow going, I’m still enjoying it-and I hope you are too. 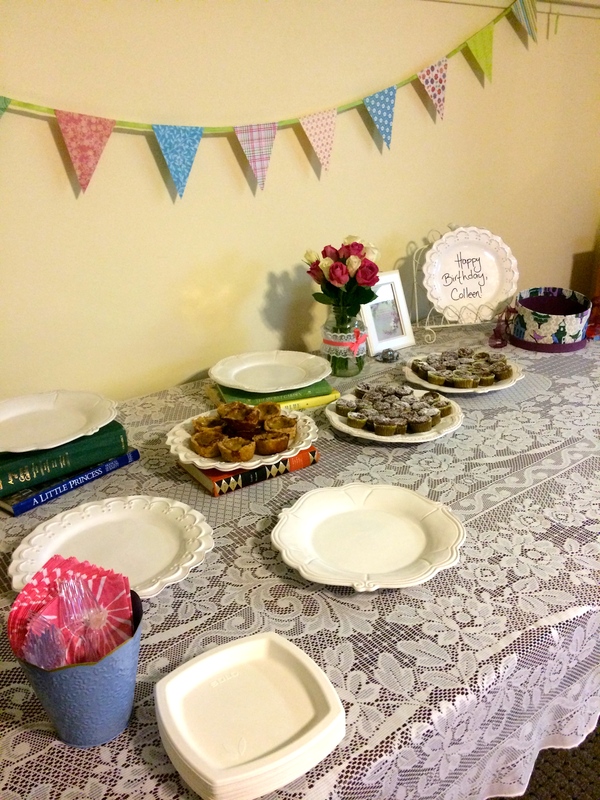 Here are some pictures of the Little Cream Pies I made for my friend Colleen’s birthday tea party back in September–a lovely evening with even lovelier ladies and an abundance of tr eats! Last week you wrote to me, introducing yourself as a colleague of my Uncle Joe. Your words about my blog were so kind. 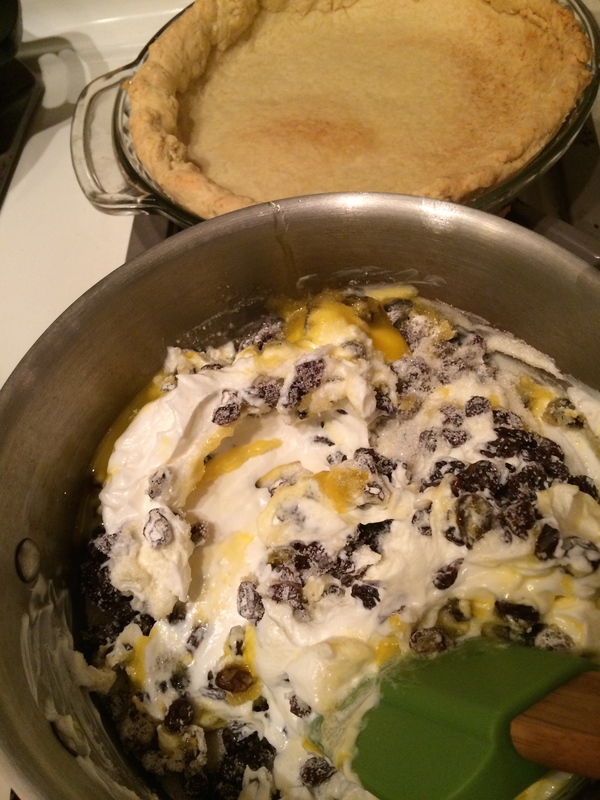 You were wondering if I had any advice on sour cream and raisin pie, as it’s your dad’s favorite and you’d like to make him one for Thanksgiving, even though you’ve never made a pie in your life. He asks for sour cream and raisin pie wherever he goes (finds it almost never) and since this is the first Thanksgiving your mom will not be present at your family dinner, you want to do something special for him. I hope your Thanksgiving dinner, though it will doubtless be bittersweet (dementia has taken a toll on both our families), will create happy new memories for all involved. Now, to get you started on this pie! 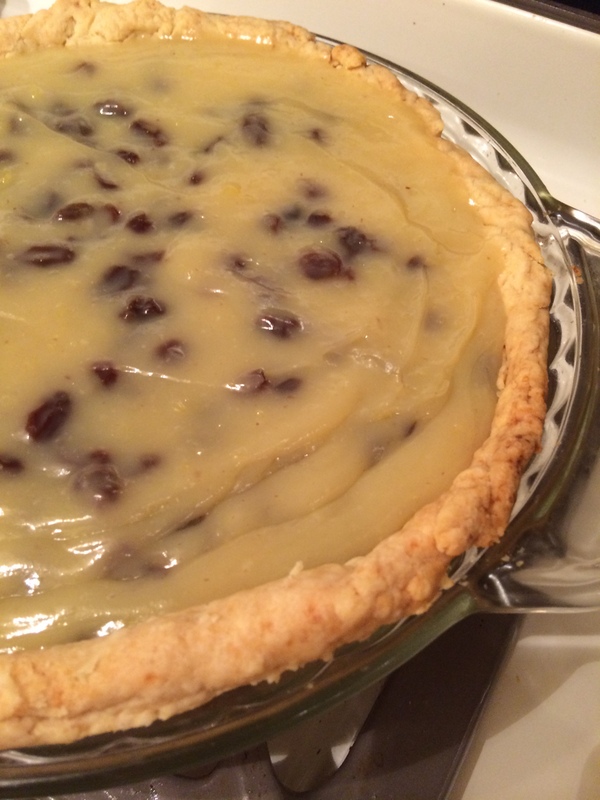 I had NEVER tried a sour cream and raisin pie myself, but there is a recipe in Ken’s book (Norske Nook Raisin Pie) which looked like a great bet. Norske Nook is a restaurant in Wisconsin, not too far away from Minnesota-sounds like this is a pie of Midwest origins. Thanks again for reaching out and I hope you find this post helpful. Cut up 1/2 stick of cold unsalted butter into small pieces and set aside. Measure out 1/4 cup of cold vegetable shortening and set aside. Combine 1 1/2 cups all-purpose flour, 1 1/2 tsp sugar, and 1/2 tsp salt in a large bowl. 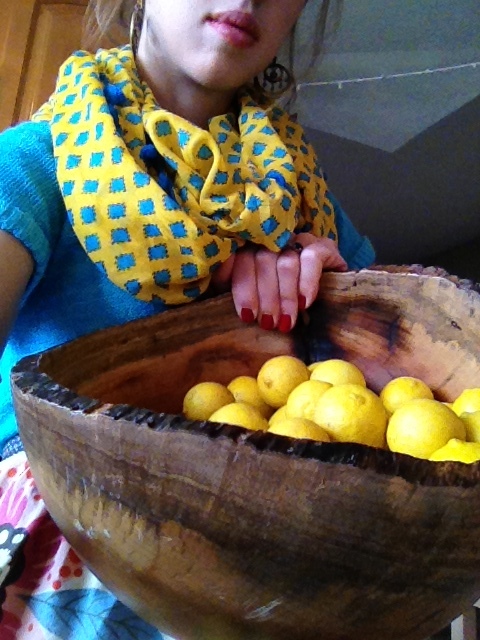 Toss well, by hand, to mix. Scatter the butter pieces over the dry ingredients and toss to mix. 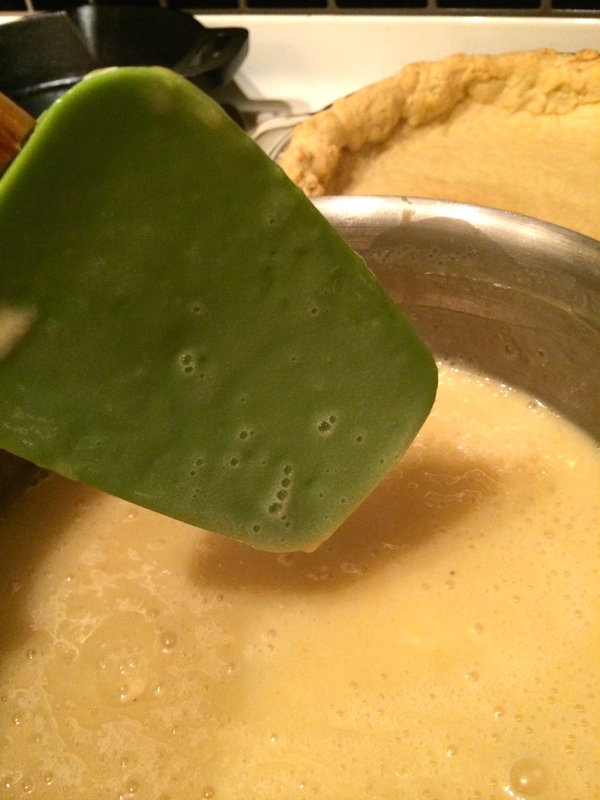 Using your fingertips, rub the butter into the flour until it is broken into pieces the size of small peas. Add the shortening and pieces and continue to rub in until the fat is all in small pieces and very much incorporated into the dry ingredients. 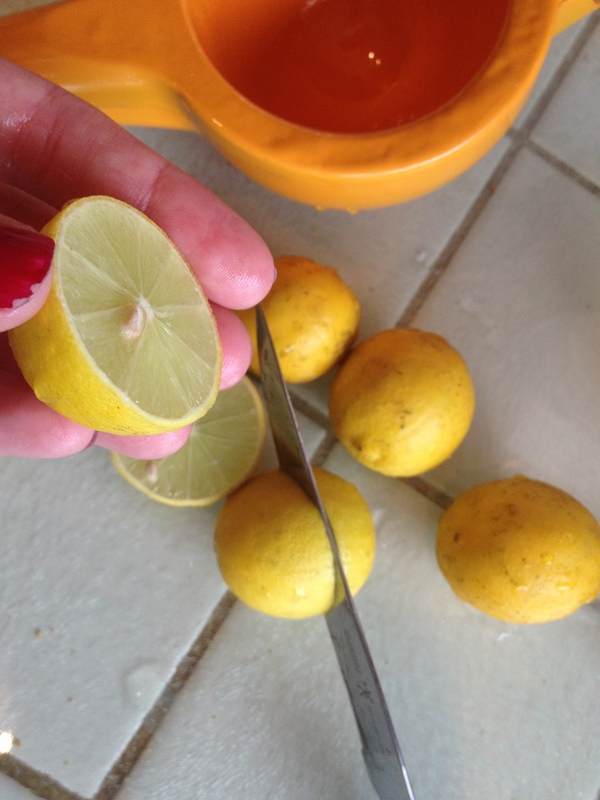 Fill the 1/4 cup you were using for shortening with cold water. Sprinkle half of the water over the mixture. Toss well with a fork to dampen the mixture. Add the remaining water, 1 1/2 to 2 tbs. at a time, and continue to toss and mix, pulling the mixture up from the bottom of the bowl on the upstroke and gently pressing down on the downstroke. Add a little more water, 1 tsp at a time, if necessary, until the dough can be packed together in a ball. 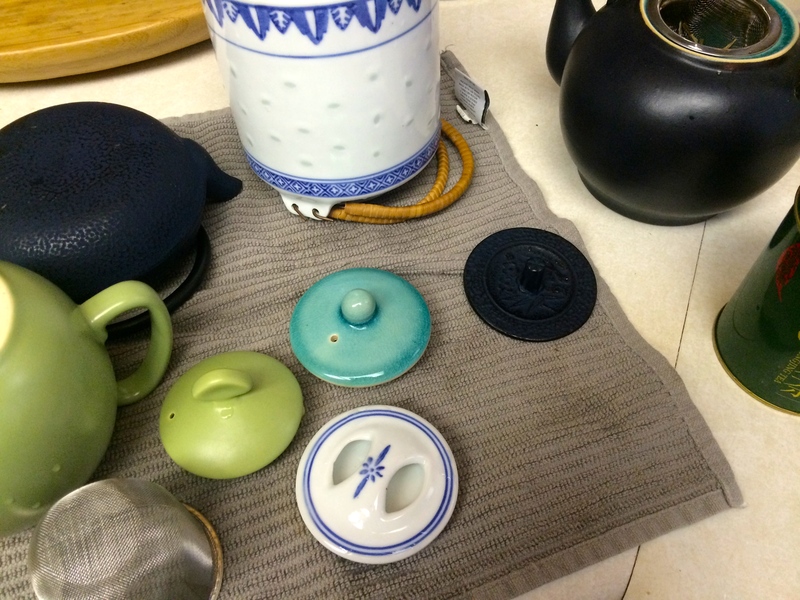 Once it is packable, make a ball and press down to flatten it somewhat into a thick disk. 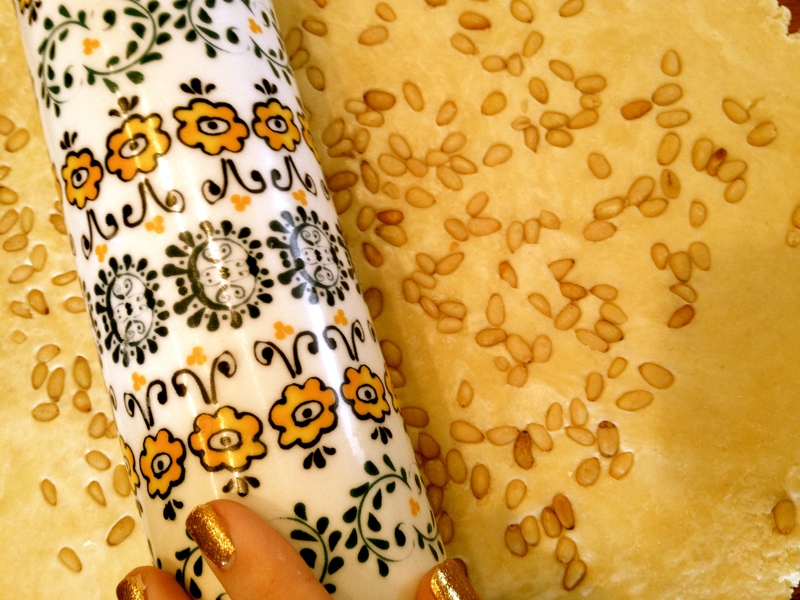 Wrap the pastry (I use a piece of wax paper and fold all the corners under) and refrigerate until firm enough to roll. This pie requires a pre-baked crust. I roll my pastry into a 12-inch circle between two sheets of wax paper-it makes it very easy to control the pastry. Once you have rolled out your pastry…Invert the pastry over a 9-inch standard pie pan, center, and peel off the paper. Tuck the pastry into the pan, without stretching it, and sculpt the edge into an upstanding ridge. Place in the freezer for 15 minutes, then fully prebake and let cool. To prebake: You will need some sort of pie weight. I use about a cup of dried beans. Tear off a piece of aluminum foil about 16 inches long. That’s more than you’ll need to fit into your pan, but the excess makes the foil easy to lift when you’re removing the beans. 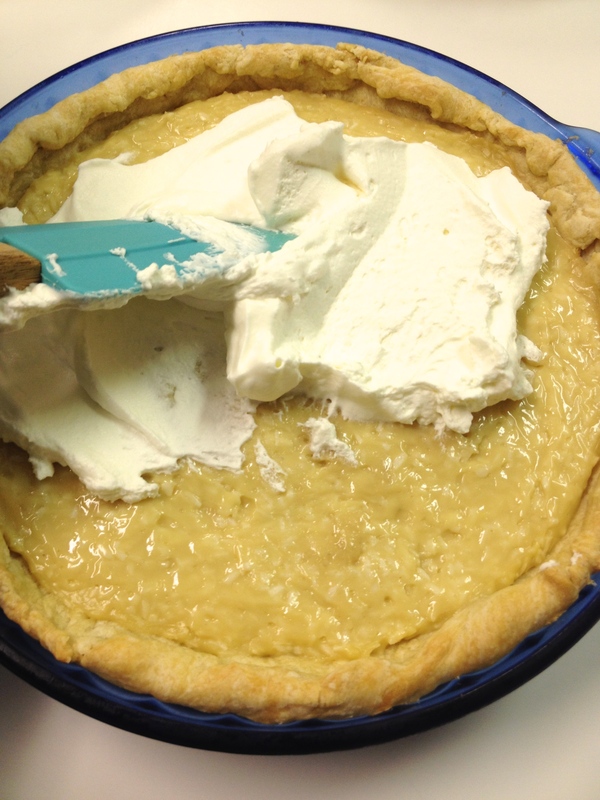 Center the foil over your pie shell and, just as you tucked the pastry into the pan, tuck the foil into the pie shell. The bottom edge should be well-defined, as should the sides. Basically, the foil should fit the pie shell like a second skin. Let the excess foil on the ends just flare out like wings. Don’t bunch it around the pie pan, or you’ll deflect heat away from the sides. Pour in enough dried beans to reach the top of the pan. With your oven preheated to 400° F, bake the pie shell on the center rack for 15 minutes. After 15 minutes, slide out the rack and slowly lift the foil with the pie weights out the pan. Lower the oven temperature to 375° F and continue to bake the pie shell for 15 more minutes. Check on the pie shell once or twice during this time to make sure it isn’t puffing up; if it is, prick the problem spot with a fork. 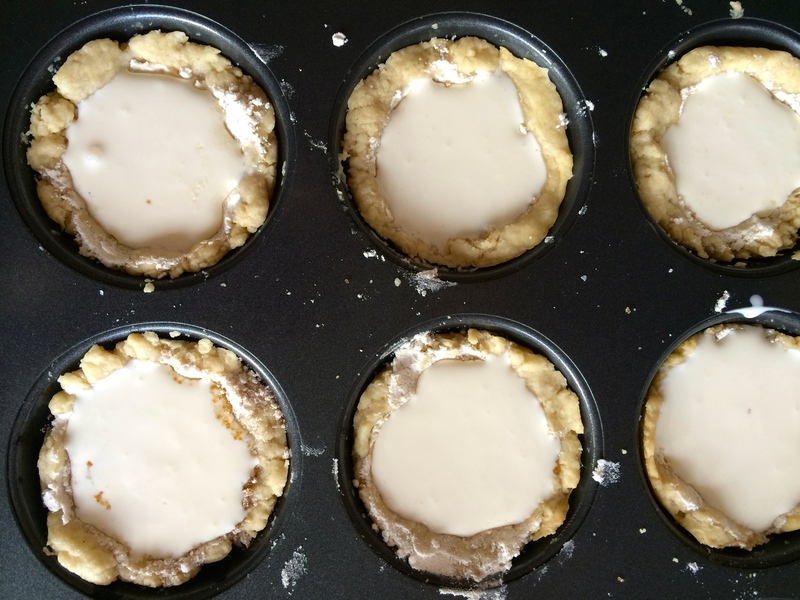 Look for visual clues that the pastry is properly baked. A fully prebaked shell will be golden brown and look fully baked. 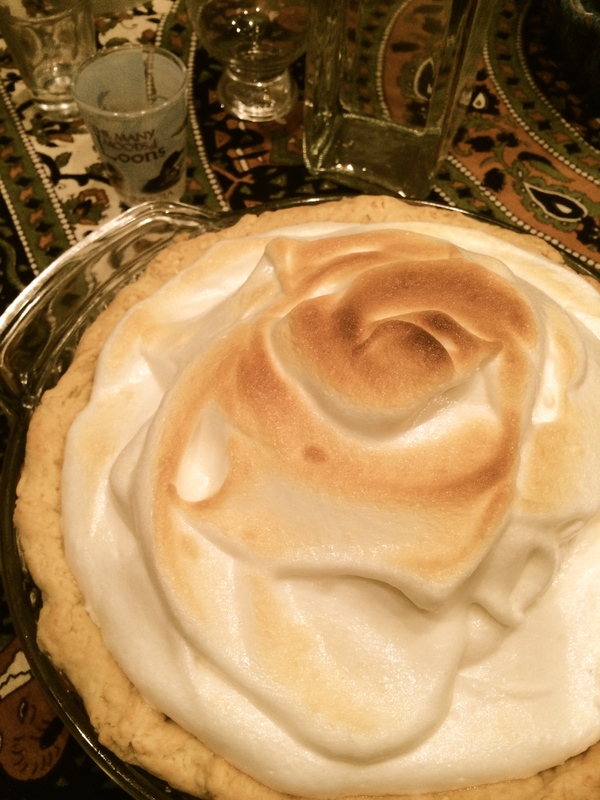 Combine 2 cups full-fat sour cream, 1 3/4 cups sugar, 4 tsp all-purpose flour, 4 large egg yolks (set the whites aside for the meringue topping!) 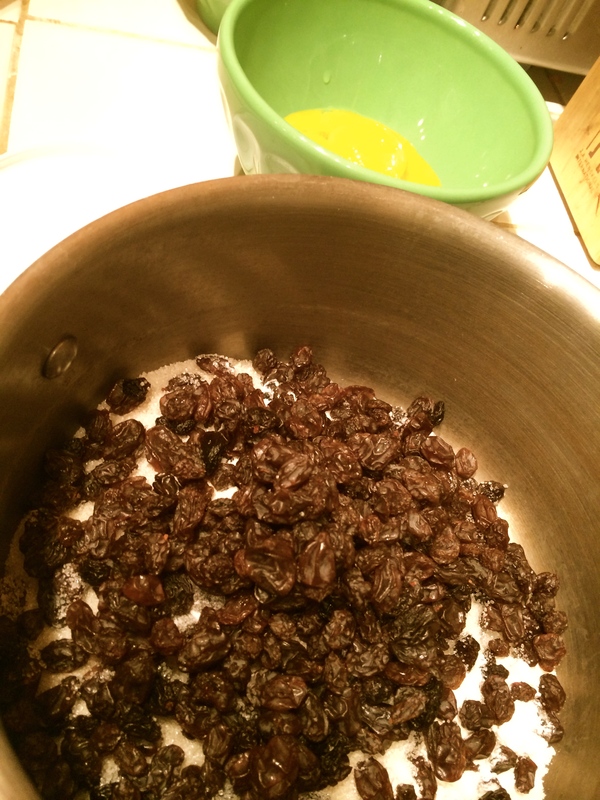 and 1 1/2 cups dark raisins in a large, heavy saucepan, preferably nonstick. 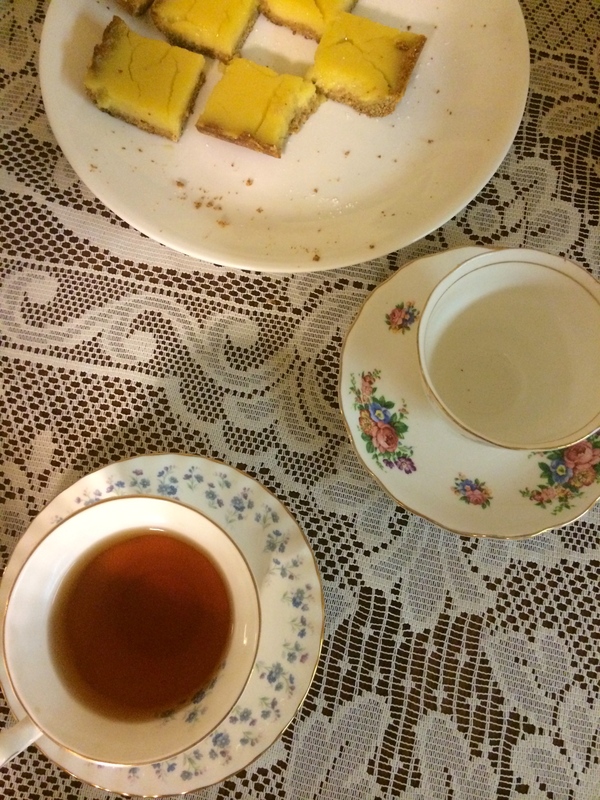 (I added a tiny splash of vanilla, per Ken’s recommendation, although that’s not in the original recipe.) Cook the mixture over medium heat, stirring continuously, until it thickens and turns glossy, 8 to 10 minutes. Slowly pour the filling into the cooled pie shell. 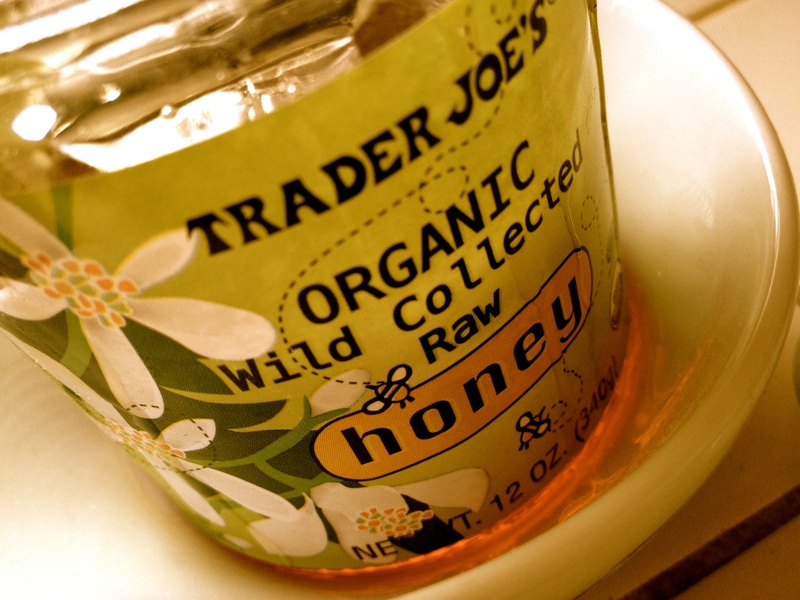 Let cool thoroughly on a wire rack, then refrigerate for at least 2 hours or overnight. 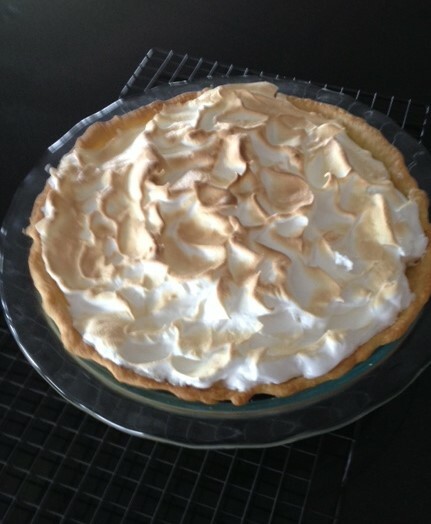 Spread the meringue thoroughly over the pie, so that it touches the entire edge of the crust, with no gaps. Briefly run the pie under the broiler until very lightly browned. Do not leave the oven, as this will take a very short time. (NOT A JOKE!) Serve immediately. 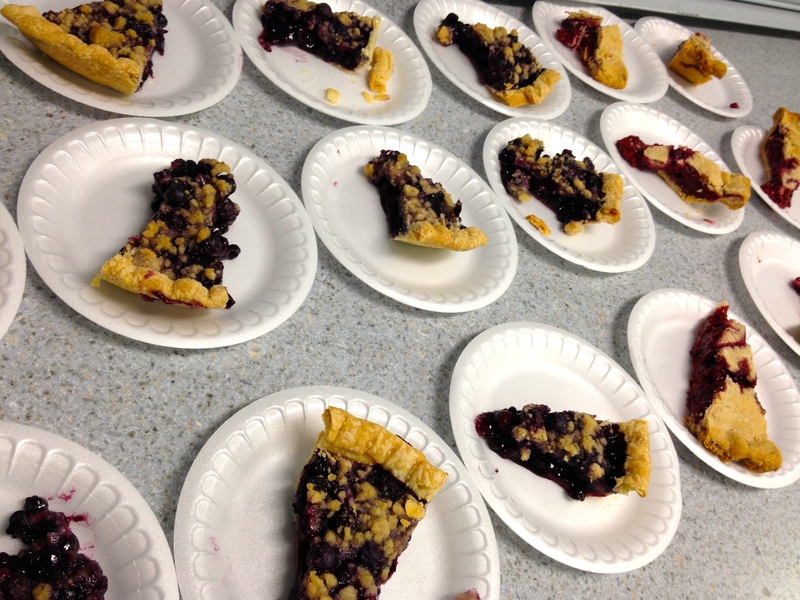 Pi Day came and went again this year with the usual fanfare it always receives at my school. 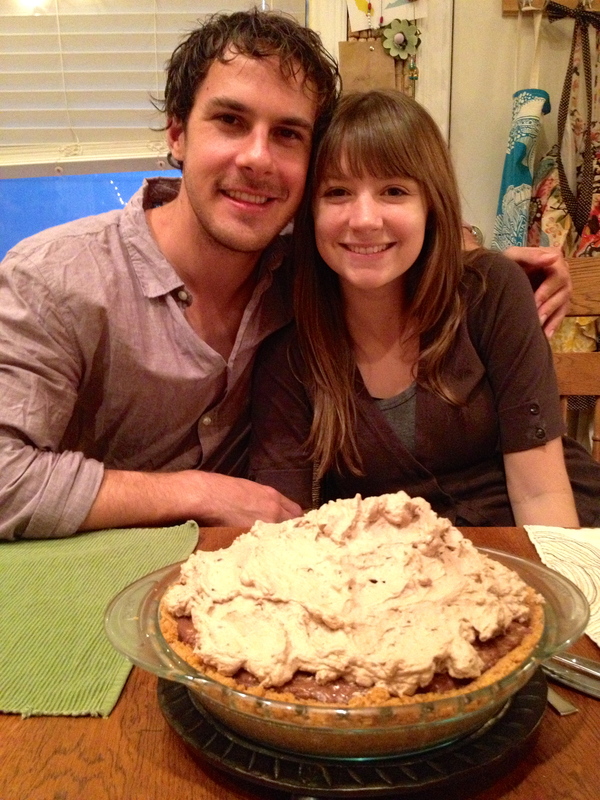 It’s hard to believe this was my fourth year making a celebratory pie…time sure does fly when you’re having fun. 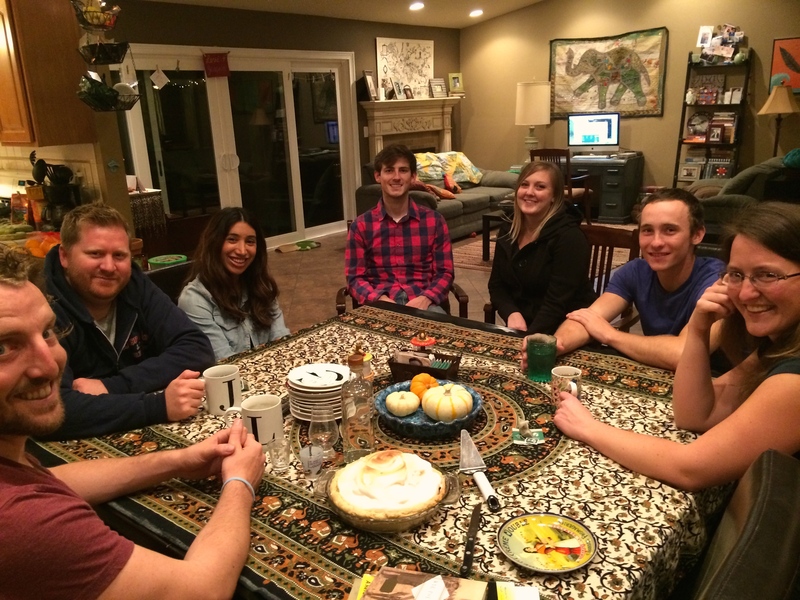 There were many contributors to the feast of pie and the subsequent sugar-induced coma. Pumpkin, raspberry, lemon meringue, apple, chocolate chip, and so many more varieties were all there for the taking. The naked pie in the center here was mine. 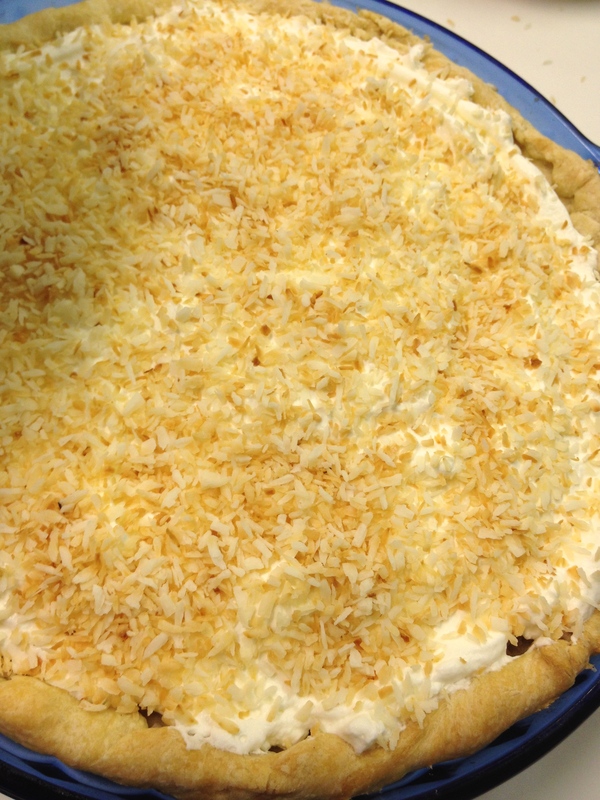 My Coconut Cream Pie, awaiting his topping of toasted coconut whipped cream. An important question to consider at this stage would be: Why have I been making pies for five years and have NEVER made a coconut cream pie before? Yeah, I have no idea either. Coconut has always been one of my favorite flavors. As a kid I would always try to convince my mom to buy a coconut from the grocery store (I know, I’m weird. Other kids were probably all like, “Buy me Lucky Charms! !” and I was the nerd asking for a whole coconut…) When I got my way it was always a project because my dad had to smash them with a hammer to get them open. Then I would stash a bunch of the broken pieces away to my room and read through my stack of library books while blissfully mawing away at my coconut chunks. I bought flaked coconut for the making of this pie. No hammers were involved. A quick note I think is worth making; I NEVER buy sweetened flaked coconut; the straight up stuff is a lot more versatile to have around and I just don’t think the sweetened variety necessary, even when recipes call for it. It’s not like the pie is sugar-free, let’s be honest. No need for the extra sweetener. Maybe that’s just my preference. It’s hard to believe, but I’m not actually a sweet tooth. Here’s me and my Pi Day Pi. All topped up now and ready to serve to the masses of clamorous children and teachers. I just love how the toasted coconut looks on top of this guy. So pretty. Oh look, what’s this? A small pie eater? 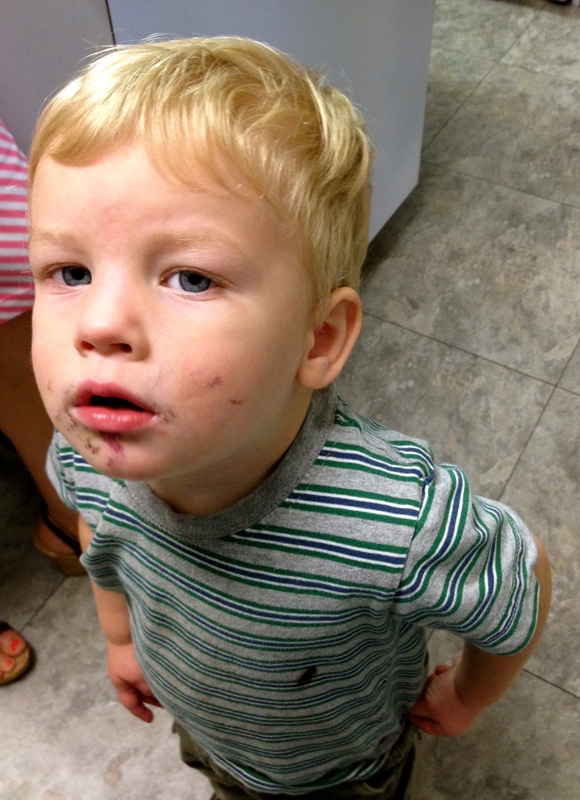 Don’t know what gave it away, other than the smudgy berry-covered face. 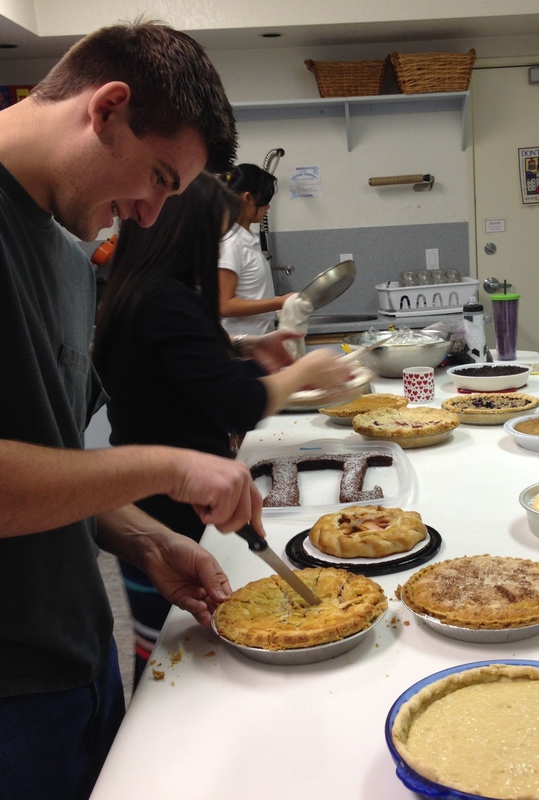 Here are the links to Pi Days past if you’d like to check them out. Thanks for reading. As always. …it’s probably time to make some key lime pies. Step Two: Juice roughly a thousand key limes (okay, probably forty) by hand with a press juicer. Be thankful you don’t currently have any paper cuts or hangnails, because the job would be a whole lot more painful if you did. This step will take you roughly forever (okay, probably half an hour.) If you have an electric juicer, by all means, please do that instead. It would be infinitely more logical. Step Three: Freeze the extra juice, which you will end up with if you are gifted this many ripe key limes at once. 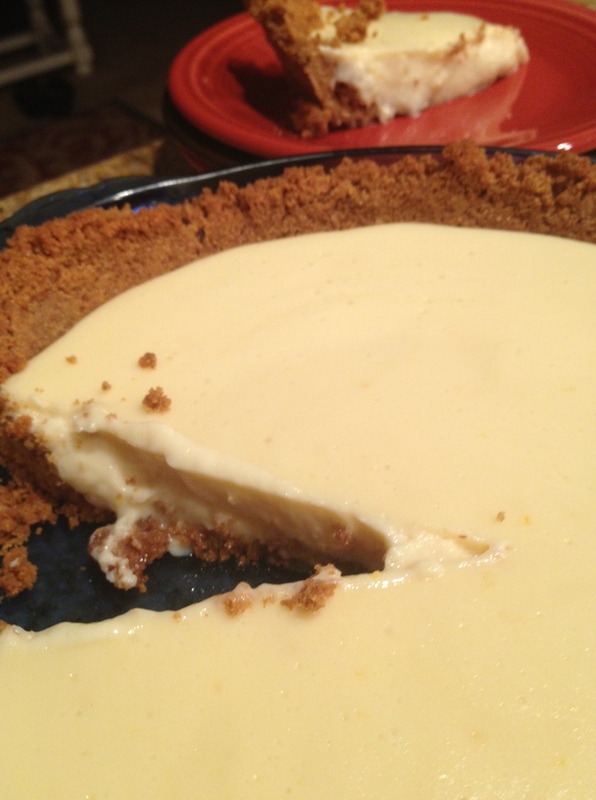 I only made one key lime pie on this particular day, but the beauty was that I was able to freeze enough juice cubes to make two more exquisitely fresh tasting key lime pies about a month later. 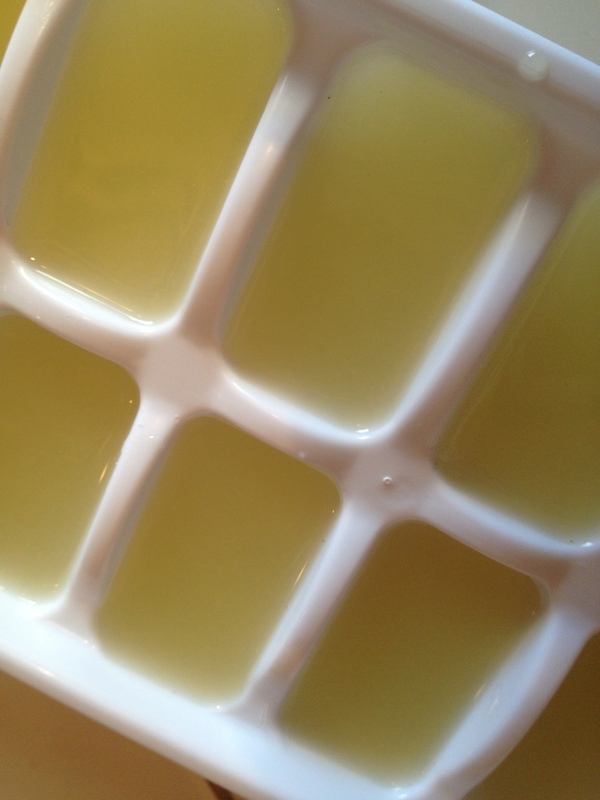 I like freezing citrus juice in ice cube trays because the smaller units are easier to defrost. 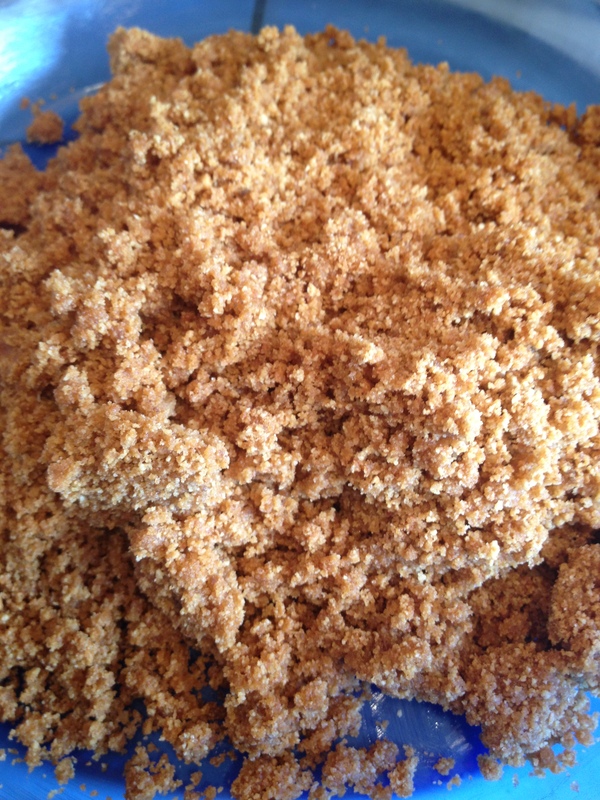 Step Four: Make a homemade graham cracker crust. I think I’ve said this before, but it bears repeating. 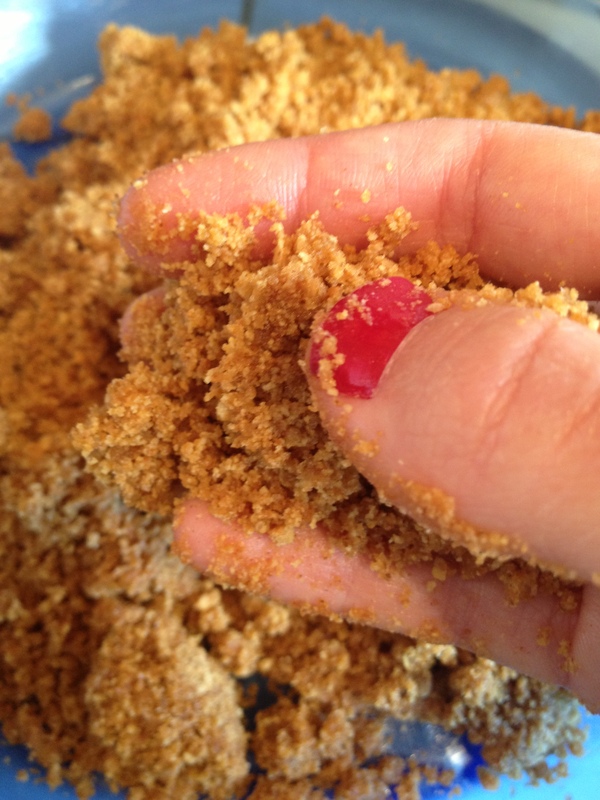 Homemade graham cracker crust is delicious; store-bought graham cracker crust is an edible container which isn’t necessarily bad but definitely would never be described as delicious. I wanted this Joe’s Stone Crab Key Lime Pie to be absolutely delicious, since I had already spent a good amount of my life squeezing the key lime juice that was to go into it. So, it had to have a homemade crust. The graham cracker crust recipe in Ken’s book is a quick mix of graham cracker crumbs, brown sugar, salt, and cinnamon with melted butter to bind it together. Once you’ve made one homemade crumb crust, you’ll never go back. Some things in life are a lot more work for a little payoff (aka hand squeezing a bunch of key limes instead of using already-squeezed key lime juice) and some are a little more work for a huge payoff (aka making a graham cracker crust by hand instead of buying one.) I think I’ve made my point, so I’ll move on. 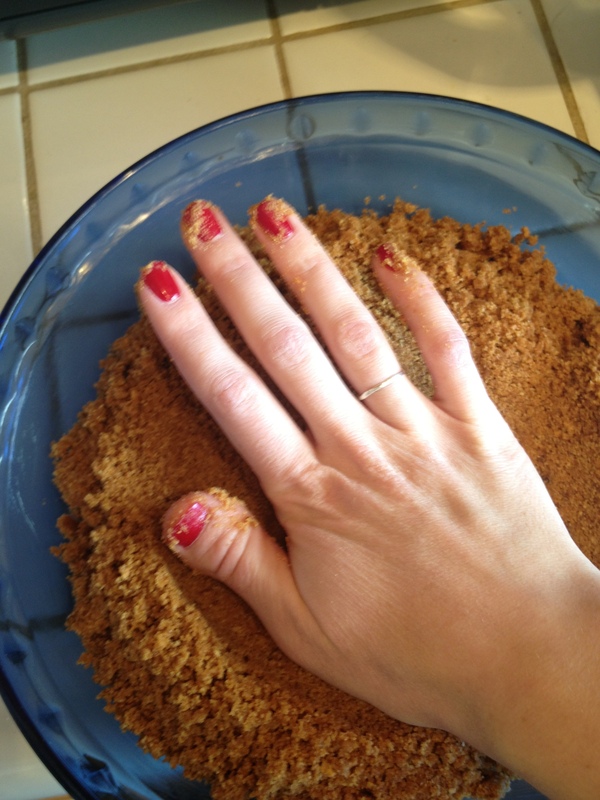 When making a graham cracker crust by hand, once you’ve got a bowlful of damp crumbs, you can just dump them into your pie plate and use your hand to pat it into shape. I usually try to make the crust go up the side of the plate just to the line I think the filling will go up to, though I often mess up and make the sides go nearly all the way to the very top of the plate. I mean, I don’t think it’s a super big deal either way. You just definitely want the crust to go at LEAST as high as the filling will. It definitely makes sense to err on the side of making the crust a bit too high. IMHO. True to form, I left off taking step by step photos after forming the crust. So, Steps Five and Six, if I were to have included them, would have covered the blending together of the filling and the pouring of the filling into the gently hand-molded crust. 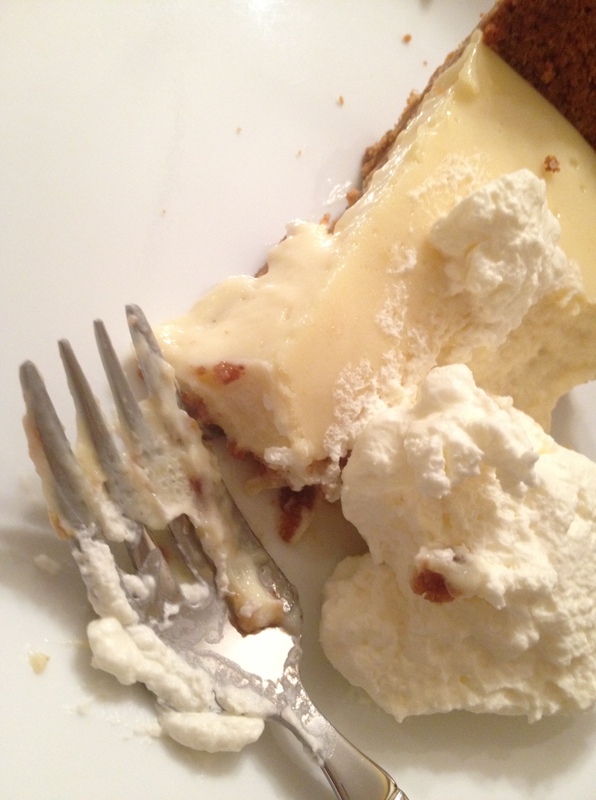 We find ourselves now at Step Seven: Eat your delicious key lime pie. You’ll know it’s the real thing because it will have a serious tang to it. 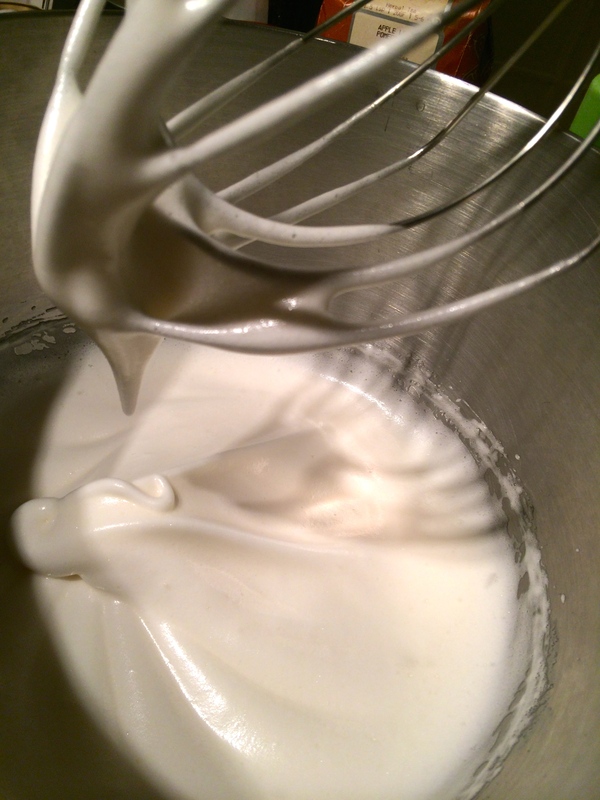 It will be creamy, even more so when freshly-whipped cream is dolloped on top. It will be so, so good. 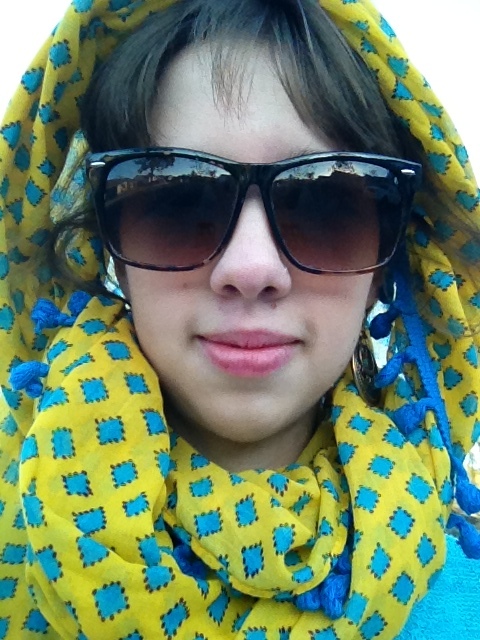 Step Eight: Put your scarf on your head and smile for one more selfie, cause you’re DONE and you’re thinking about how much key lime juice still awaits you in your freezer. P.S. You guys caught me again. 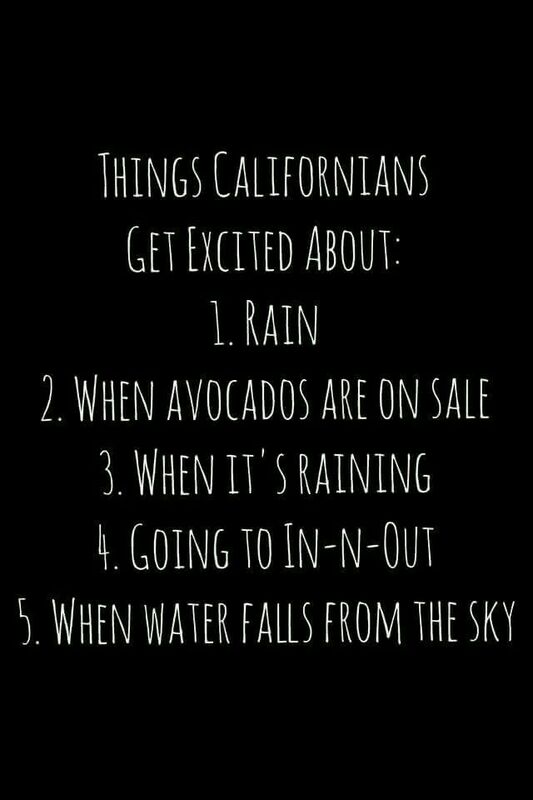 It’s not key lime season in California’s May. It’s key lime season in January. 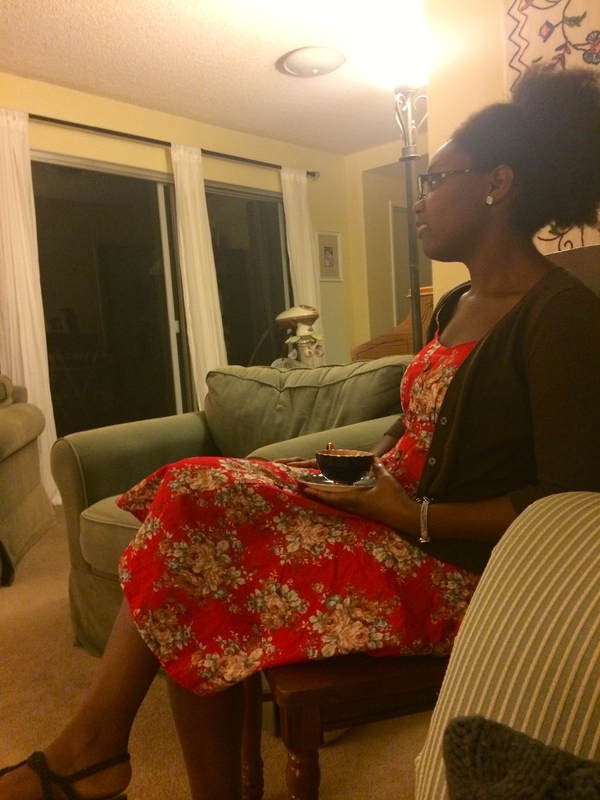 Shhh…don’t tell anyone how slow of a blogger I am, okay? Not kept my blog up to date, that’s for a surety. 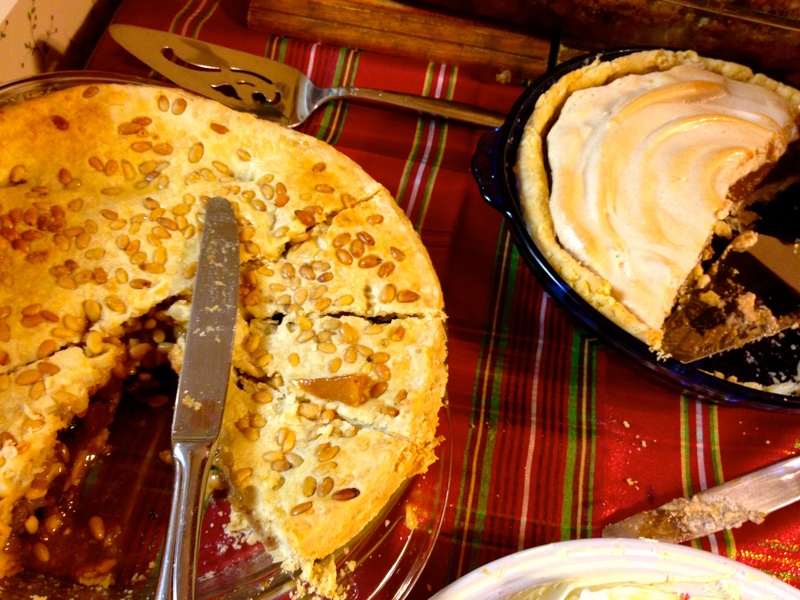 Let’s not dwell on the fact that these pies were made at Christmastime. Just ignore Levi’s “Merry Christmas, Ya Filthy Animal” sweater in the picture below, which was supposed to be a selfie with a pie (the pie was in the basket) but instead you can just see Levi and I, so I guess instead of a piefie, I ended up with a spousie. 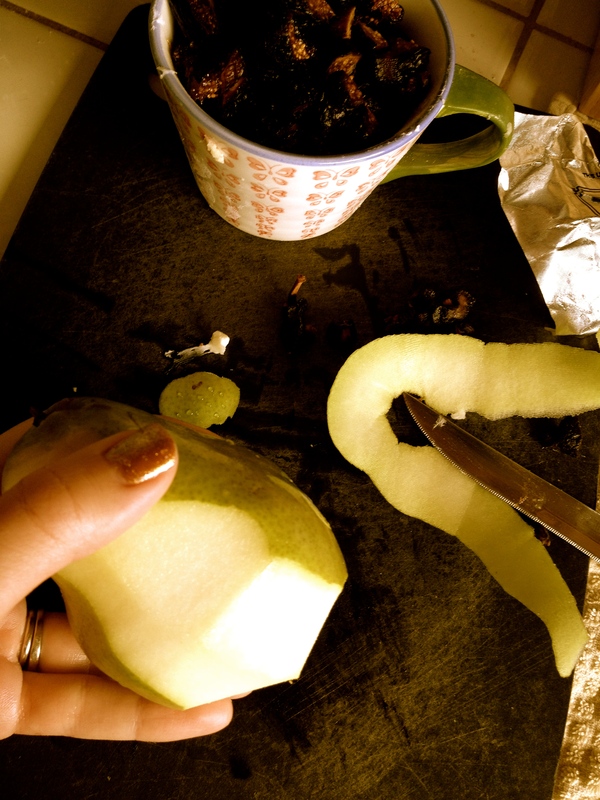 Also, please forgive the fact that nearly every picture below, taken while putting together the astonishingly beautiful Pear and Fig Pie with a Pine Nut Crust, shows off my glittery holiday manicure. This pie is made with dried figs, which I don’t love half so much as the fresh figs that my Great-Uncle Benny somehow grew every summer in his concrete backyard. 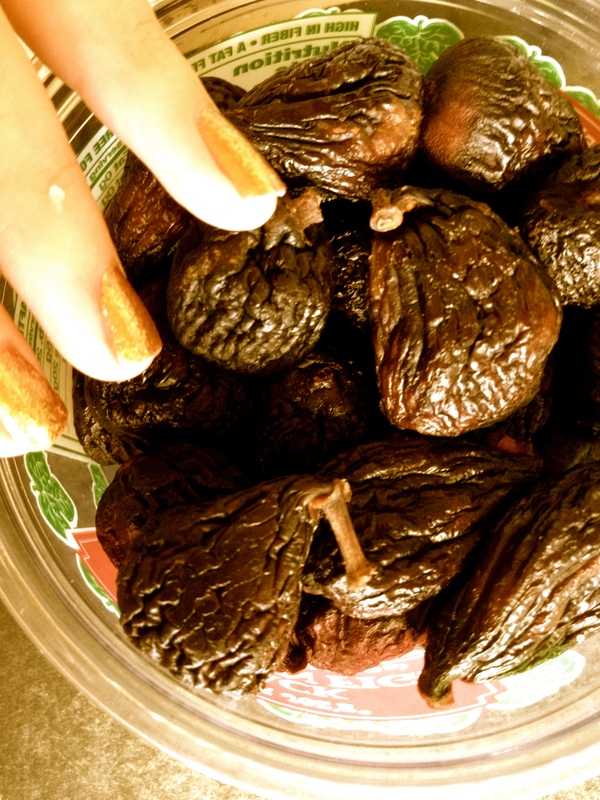 Still, the combination of fig, pear, honey, and pine nut is really a delight. 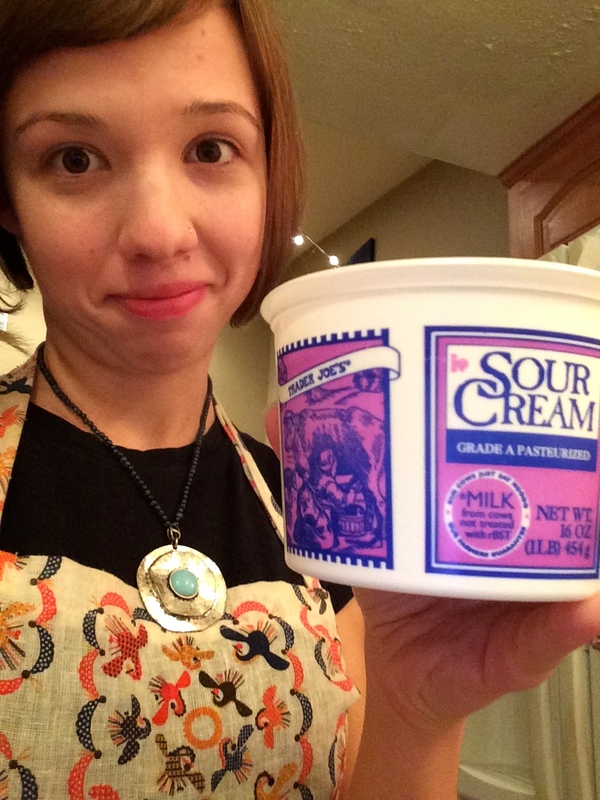 Trader Joe’s should pay me for all the advertising I do for them. HONESTly. 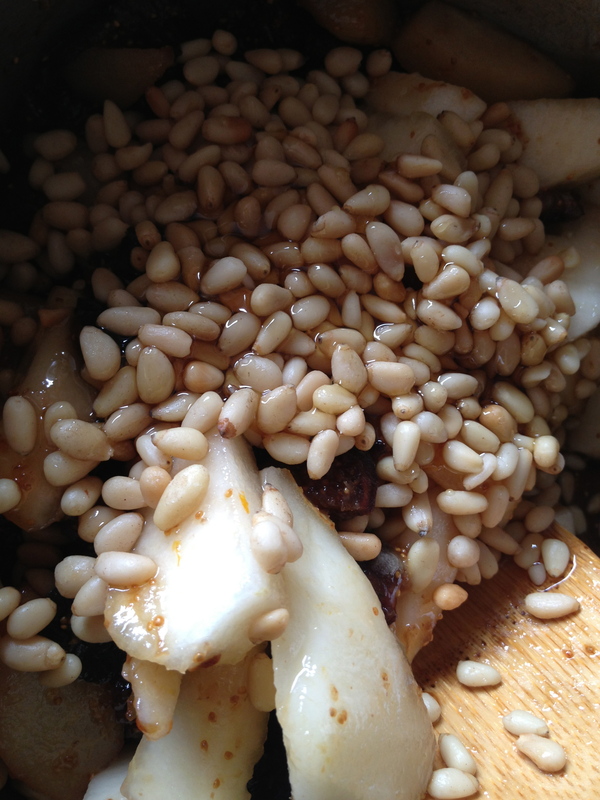 To make the crust, just roll out a standard crust and then sprinkle the pine nuts over the top and gently press them in, your fantastic fingernails guiding the rolling pin. When glazed with milk and sugar and baked, this pie truly looks like a masterpiece. Studding the top crust with nuts would be a fun trick for a variety of pies…just keep an eye out for burning and be prepared to tent the pie with aluminum foil for part of the baking if needed. So here’s something that happens often. (As in, every time I make more than one pie at a time.) I do a swell job documenting the process of whatever pie I start first. Then, by the time I remember that I still have a whole other pie to make and it’s probably past my bedtime already, I don’t bother with all the pictures and just take one token one of the finished product. 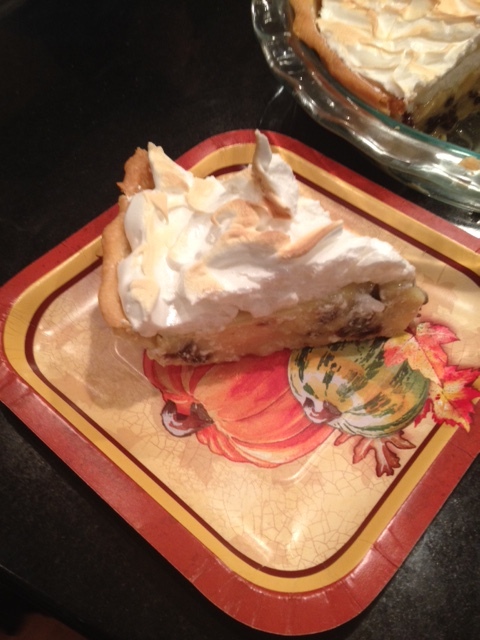 I have way fewer pictures of this Chocolate Cream Pie with Cinnamon Meringue. Point to ponder: Is that what’s going to happen when I have two children…? 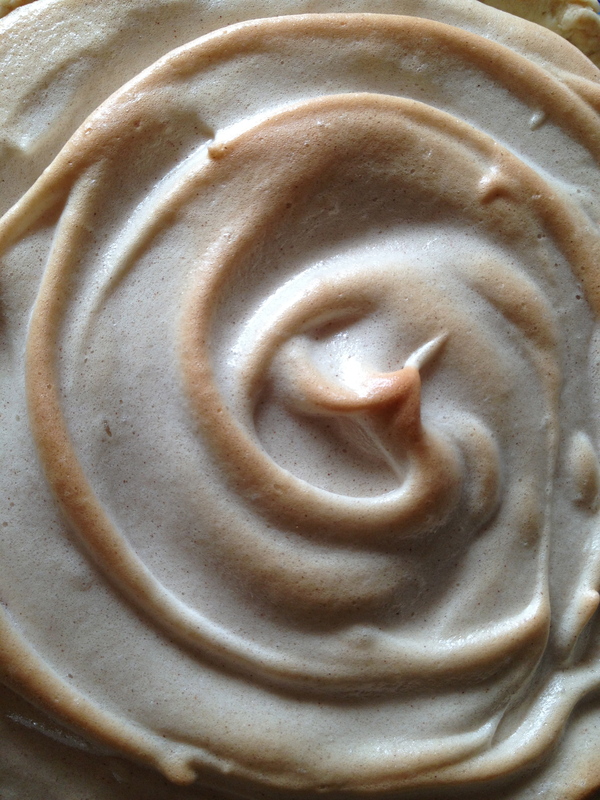 Let it be known; this was MY FIRST EVER MERINGUE. I kid you not. I’ve been making new pies for going on five years now and I’ve never made a stinkin’ meringue before. And look how purty it turned out. I’m such a proud mama. Okay…if Green Tomato Pie didn’t get you too excited…from the poll results it looked like about 30% of you had serious doubts…maybe this one will. 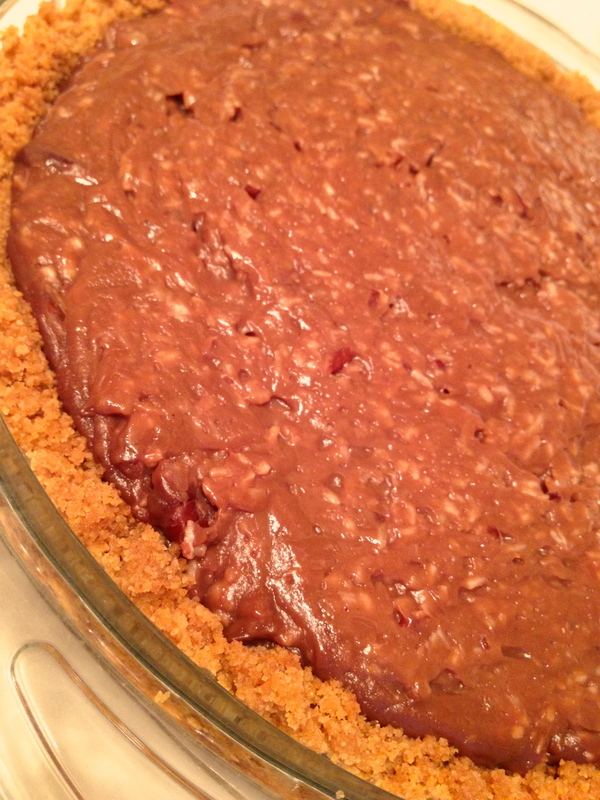 The Hammett House Famous German Chocolate Pie. I’ve never been to the Hammett House Restaurant (namely because it is in Oklahoma) but I get good feelings about it. Really good feelings. 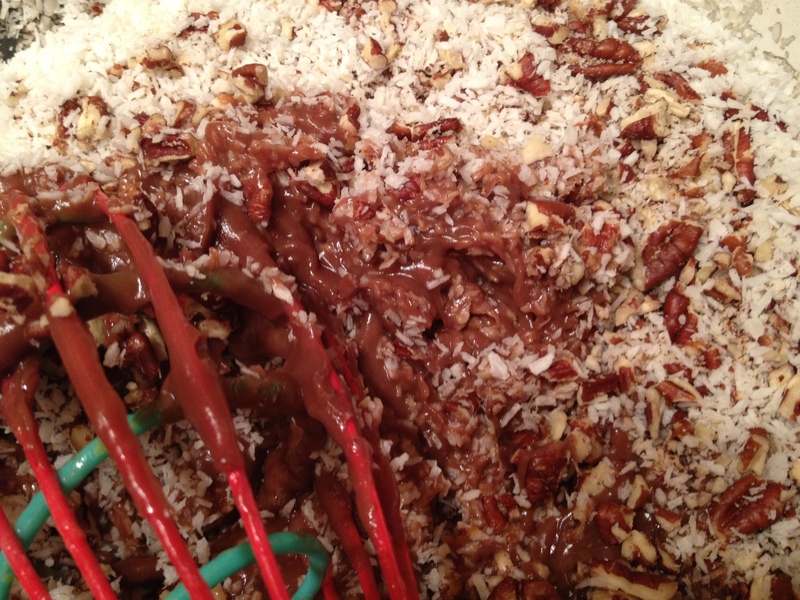 First let’s just take a look at the way the coconut and pecans are being folded into the chocolate cream filling here…it’s a thing of beauty. Literally, this picture makes me drool. As if the homemade graham cracker crust and luscious chocolately filling weren’t enough, the pie gets topped with chocolate whipped cream with more pecans and coconut mixed in. It’s almost too good to be true. The end result just looks like a mess. A beautiful mess. It’s also MONSTROUS in size. The hugest pie you will probably ever encounter.